I say currently because my process is constantly changing and evolving as my life changes, like any good organizational system should. About 6 months ago I post about my daily routine. With the change in John's schedule, things are a bit different which you'll see below. Personally, I love seeing how people plan and organize their days, whether it's a system that works for me or not. I was fascinated with Alyssa's post about this, and we use Google calendar in some of the same ways so I figured I'd copy her and do a post on this topic too - so it's a little different then what I do each minute of the day like my previous post, it's more like what organizational systems I have in place that allow me to keep to my routine I talked about. I keep a similar routine, time-wise, as my previous post. Our life is a little strange now, of course. John works for 24 hours and then is off for 48, and currently can't work any other jobs. I still work 8 to 5 and my commute is the same, but now that I don't have to get up at 4:30 every day, I just readjusted a bit; I do a little less in the mornings, like food prep and long dog walks, and moved those to after work and stay up a little later. On the days John has off, I don't do dog walks at all! And we both start laundry and dishwasher cycles as needed. Like Alyssa, I use Google calendar for scheduling general life things, like birthdays, appointments, and special events. It also reminds on the 1st of the month to give Hawkeye her flea and heart worm meds, and there's a bills calendar that shows when my automatic payments get taken out, but I don't pay much attention since I know they get paid and I know the amount. This is just where I get a general overview of what's happening in the week/month/year. My meal planning process is exactly the same as this post, only now I have to do a little less because every firehouse in Chicago has a cook, and John eats all his meals there in a 24 hour period. He takes snacks and leftovers if they're making something he hates. The having a cook thing is one part of the fire life I can totally get behind. As far as cleaning the house, we do get a regular cleaning lady in, which I love. She comes every 6 to 8 weeks, depending on our schedules, and she does the deep cleaning stuff which is zero fun. So I don't need to worry about things like baseboards, windows, or fan blades! It's worth every penny, so I prioritize this financially. Once she's done, I just keep up with the cleaning she did. I have a weekly task list and as long as I check each thing off before Friday, I don't stress too much about which day I do things. My tasks are bathrooms, kitchen, mopping floors, and wiping surfaces that aren't kitchen and bathroom, so like the TV stand and dresser and such. (Vacuuming is no longer on the list, since we got the robot vacuum and just let him do his thing throughout the week. I'll spot clean corners that he missed, but that rarely needs to be done.) Some weeks I'll do one thing each morning, Monday through Thursday, some weeks I can get more than 1 thing done at night since they're super quick and John is at work. So the house is always totally clean for the weekends, which is when we have people over or people stop by. I have a little task list on the side of my Google calendar that lists these and I could check them off but let's be honest - I don't need a calendar to remember 4 things, and I don't need to check them off to remember what I've already done in a week. I do laundry as it comes up throughout the week, like I mentioned, and sheets and towels all get done on Sundays. I have a totally separate calendar for work - we have the Outlook set up, where every in the office can see everyone's calendar, so you know when someone is at court or needs to be covered on something if they're out of the office. I put the major things on there, like client meetings and court dates, and I put reminders a week out in advance when something is due. Then I just steadily work each day on whatever is coming up and field phone calls. I leave work at work, so I don't look at this calendar or my work e-mail at all outside the hours of 8 to 5, Monday through Friday. I have a calendar in Google drive that's set up like an Excel spreadsheet - it has rows and columns, and along the bottom are different tabs, which is each different month of 2017. 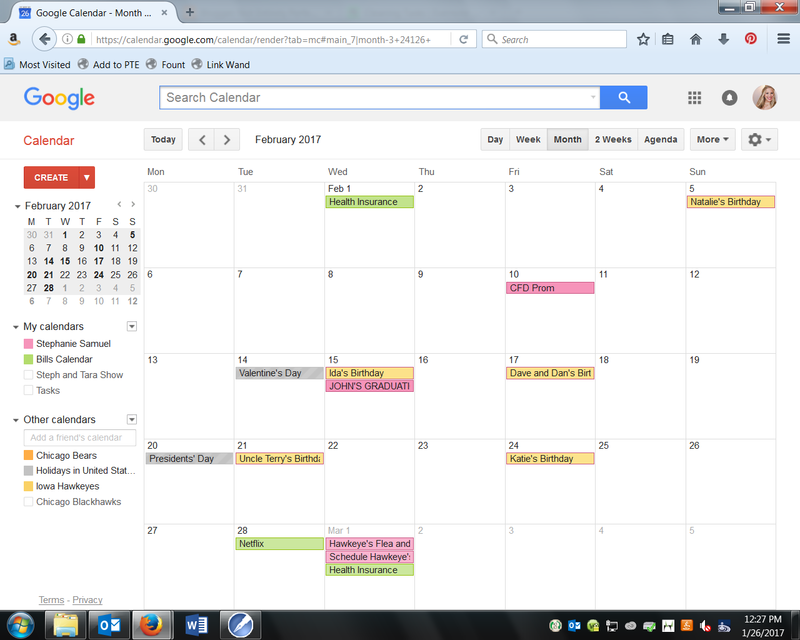 On each tab, I can see the month at a glace, like a typical monthly calendar spread. Then I can type in each day's box, and this is where I put the title of that day's blog post. You can save a blank copy to your own Google drive if you think it would help you too. (P.S. it's set up to change all the dates automatically if you change the year on the top of the first tab, should you want to use it in 2018 too.) During the month of December, I went through and added post topic ideas on every single week day for the entire year, which was definitely a process but so worth it. I can look at each month and figure out what I feel like writing about and it's easy to move them around if I change my mind. I use colors to help me see what's done, what's in progress, and what I still need to start. This was January's calendar, everything's in bold since they've been published. I like having at least the ideas down and tied to certain months when they make sense (like zero waste coming in April for Earth Day! ), because I get into moods where I want to write and can type out a solid 10 posts in an hour, and other times where I don't want to write for a week or 2. When the mood hits, I know what I need to work on. I'm super far ahead as far as having posts written, which helps so I never feel stressed about getting something published. (I wrote this post on January 26, by the way, and it's the last one I finished for the month of February.) On days I don't feel like writing, I make my images on Canva. I generally work on blog things during my work breaks, 15 minutes or so every hour, at lunch if it's too cold to go outside, and on the weekends if we're relaxing at home. If you've followed me for any amount of time, you know how I love a good goals list. I have my 101 in 1001 list on Day Zero Project, I have a 2017 bucket list here, and I make seasonal goals on the blog. Plus I occasionally throw in other things like a spending freeze or a declutter challenge. Since these are all tracked digitally, I have a Google calendar reminder each Monday just to check in with the various lists. That way I can track progress and plan any that are seasonally specific. 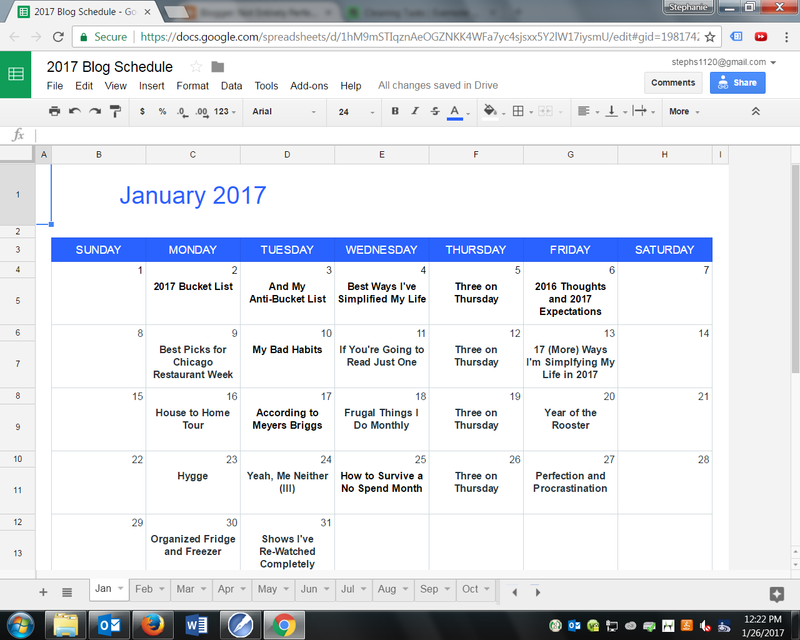 Each week I decide what I might have time to work on and note that in my Google calendar if I need to. Besides goals lists, I use Evernote to keep a couple of other running lists including blog post ideas, Christmas gift ideas, the log in info for various online accounts, and running shopping and to do lists. Since it syncs between my computer and phone, I'm able to glance at my to do list each morning and see if there's anything I want to tackle that day. It seems like a lot since it's all typed out in detail but in practice, it's pretty simple. I'm really trying to simplify everything in my life so I've made an effort not to let things get too nuts - simple eating, less makeup and shower products used in the morning, less cleaning products, etc. I'd say blogging is the most complicated but I enjoy it and I've streamlined my process so it's not bad. Can you see what's missing from my organizational and planning system? Paper. Can you believe it? I know, in the past I've been queen of the paper planner and I definitely think you should try that route if you've got a lot of balls in the air and love writing things down. 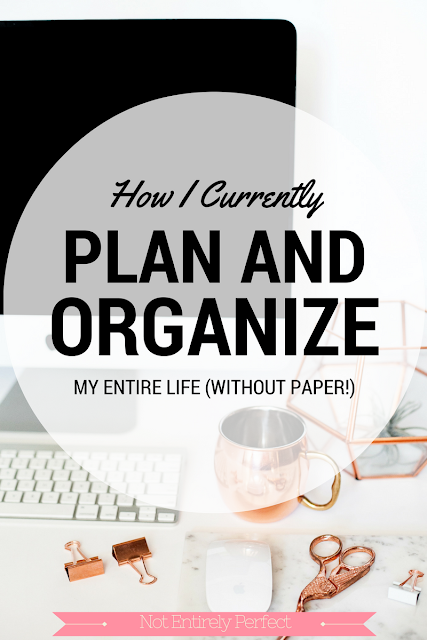 But for where I'm at currently, I just don't have the need for a paper planner; it would just be one more task on the list and one more piece of clutter. I didn't think I'd embrace a totally digital system but I'm really enjoying it! 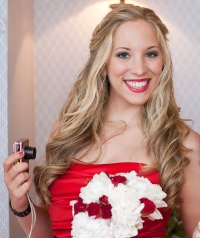 How do you plan and organize your life? Let me know if you have a post about it, because I love reading them!